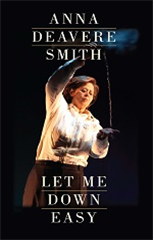 Compiled from dozens of interviews conducted by the author, Anna Deavere Smith’s Let Me Down Easy is a bracing, tender, melancholy, and triumphant exploration of death and dying. The speakers Smith inhabits include healthcare professionals, theologians, artists, athletes, and activists. They speak of the body as a battleground, a tool, a weapon, a joy, a burden. Smith’s great gift has always been her ability to break down her subjects’ defenses and present them in their full, complicated beauty. Whether channeling Lance Armstrong, Lauren Hutton, Peter Gomes, or others who are not in the public eye, Smith reminds us again and again that in learning to die we learn to live.